My 1-2-3 Cents : Hogan vs. Flair: Who Was 'the Man'? In the 1980's most wrestling fans dreamed of the day when WWF world champion Hulk Hogan would lock up with NWA world champion Ric Flair. The two had dominated their respective companies for years. When Flair finally jumped ship in 1991, Hogan was nearing the end of his time with the WWF. We never got that big pay per view match between the two. I know they had several matches on the house show circuit. I never understood why Vince didn't cash in at Wrestlemania 8 with a big Hogan vs. Flair match. It would have been the greatest main event in the history of the event. Maybe of all time. 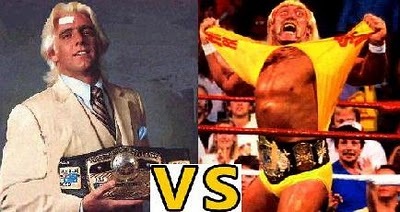 Since then, Flair and Hogan have wrestled countless times in WCW, WWE, and the Hulkamania tour in Australia. The two had been at odds in TNA too, but now are in the same group. This post today will look at each man as they were champion. I know that image is hard to tell maybe, I took it when I was 12 years old. 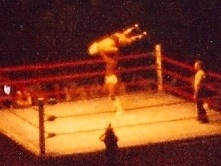 It's Ric Flair vs. Kerry Von Erich at the Kiel Auditorium in St. Louis. This was less than a year after Flair had lost the NWA title to Von Erich and regained it. So this would have been Flair's third or fourth title reign. In the 80's Flair won and lost the world title several times. Look at his opponents in that era. Much different than the ones Hogan faces. Flair was traveling around all the territories of the NWA, including World Class, Florida, Midsouth, you get the picture. He'd go against the Von Erichs, Barry Windham, Dusty Rhodes, Sting, Harley Race, etc. I remember seeing him live against Kerry Von Erich and the next time he was in town he was taking on Bruiser Brody. Talk about a couple of contrasting competitors. It seemed like most of Hulk Hogan's defenses came against more of the monster heel types. The big guys. John Studd, King Kong Bundy, Andre the Giant, One Man Gang, and Big Bossman. Not knocking these guys, but they were not the same caliber as a Magnum T.A. or a Sting. The other thing was that Hogan was so dominate. He went on 4 years without losing the title. So it seemed like no one would ever be able to beat him. With Flair dropping the belt every 10 to 12 months and regaining it, it made it seem more like someone could beat him and be the champion. As a fan, you want to think the guy who's going for the title has a chance. When Hogan defended the belt, you never really felt that. I mean, would Sika or Nikolai Volkoff ever really win the world title? In the NWA you could see Nikita Koloff or Barry Windham winning the belt. Clearly in the 80's Vince wanted a dominate force. Someone he could market. Someone kids could look up. That was his mission and he was successful with it. The champion who defended against the monsters of the world. Slamming the giants. Pinning the wild beasts. Posing for the masses, who in turn watched his cartoons, bought his toys, and ate his ice cream bars. Crockett Promotions took a different approach. I guess you could argue that formula wasn't as successful as the NWA/WCW are no longer around. The hated champ that fans wanted to see get beat. They'd pay their money for the chance to have Lex Luger or one of the Road Warriors take him down a notch. And Flair did lose a lot of those big matches. Usually by disqualification or countout. I think the plan there was to have fans pay again next time and see him lose for real. Maybe it will happen. As a kid I grew up loving the WWF. I was a Hulkamanic too. Don't judge me. I also watched the NWA obviously. And I loved watching Flair in the ring. I loved it more when Kerry Von Erich or Magnum T.A. would take it to him though. I know now that's all a part of the machine of marketing. It's exactly what they wanted. So who was the man? Back then I would have said Hogan. Now I say Flair, just based on the level of competition. Besides, does it matter now? Probably not, but it's fun looking back and thinking about the way things used to be. Simply put, if you like wresting, Flair is the man. If you like Sports Entertainment, Hogan is the man. Where is Friday's Freak of the Week?